Can you be my Leonard Cohen? Would you like to win a copy of Leonard's new album, Old Ideas? Our friends at With a Bullet would like to send you the latest CD from the bard of darkness and all you have to do is write me a poem. Pour your soul out in the comments or send me a tortured email, just make sure that you channel your best inner Cohen, and that you send it before Thursday, Feb 2 at midnight MT. The winner of the most Cohenesque entry will be chosen by a panel, and will have my eternal admiration. In addition to your shiny new copy of Old Ideas, of course. Need a little inspiration? 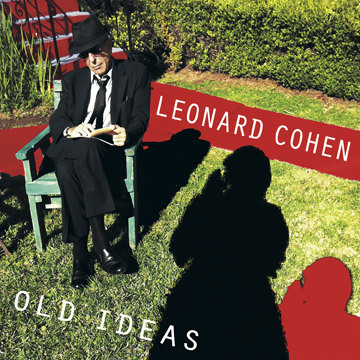 You can stream Leonard Cohen's Old Ideas below. Now go forth and bleed, my precious. Looking forward to listening to the album on the weekend! I have written poems. I cannot write these kinds of poems, I don't think. And by "these kinds" I mean proper and good and whatnot. But I want to read the entries! I'm not so sure how proper and good and whatnot these poems will end up being, Lesley, so feel free to toss some of your own into the ring if so inclined. Discovering Leonard Cohen when I was a teenager was a pivotal moment in my life. I couldn't even dream of writing a poem as lovely as "Suzanne." "Suzanne" is a pretty high bar to be aiming at, Johnny. Not many of us could scribble out a poem like that. I too discovered Cohen in my teens and "pivotal" is exactly what that moment was. 'The Future' spoke to my brooding teenage soul in a way that no other song had before and, I suspect, no song ever will again! I think there is something magical about discovering Leonard Cohen in your teenage years, MrsRitchie. But now I am trying to imagine the broody teenaged Mrs Ritchie!